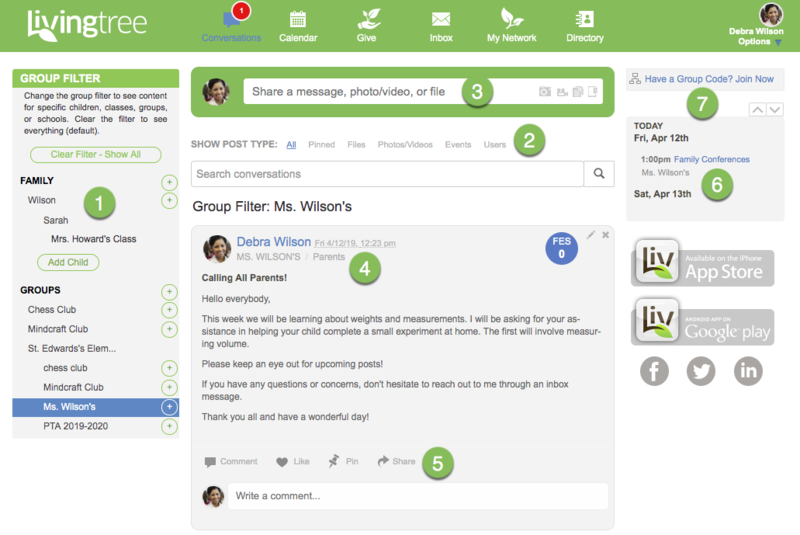 'Conversations' is the place to make announcements, share files, photos, links, events, and more. Scroll through your stream to view and engage in the conversation. The left navigation allows you to easily filter through the activity in your 'Conversations' dashboard by clicking on a specific child, group or extended family. When you click ‘Clear Filter’ in the upper left, you can view all your 'Conversations' activity at once. You can also filter your 'Conversations' stream by Events, Photos, Files, or by items you have 'Pinned.' For example, to quickly browse all of the photos shared with and by you, select the Filter by - 'Photos' option. To create and share a post, select the type of post you'd like to make (messages, photos, files or text). The post box will appear on your screen. Scroll down to read more on creating a post. Click on the respective buttons to 'Comment,' 'Like,' 'Pin' of 'Share' a post. Pinning a post will store the post in the 'Pinned' stream. Filtering by 'Pinned' will narrow your search to only the items you have pinned. On the right side, you'll find an at-a-glance view of the activities coming up in the next two days. Simply click on a specific event to view the details of the event. You can plug in a group code to connect with a class or group any time you see the green 'Join Now' button.